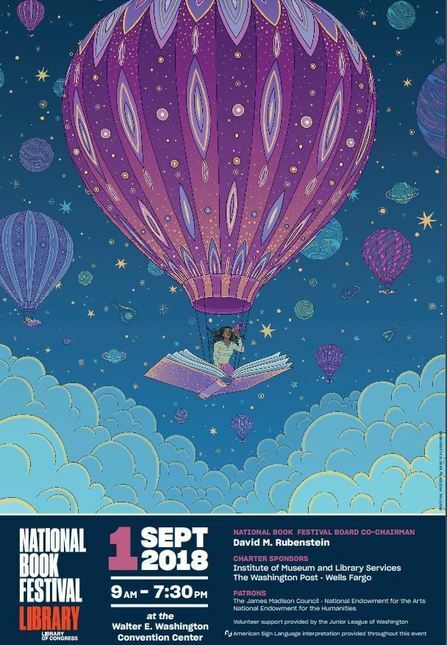 WASHINGTON, D.C. (August 27, 2018) — Join the National Endowment for the Humanities (NEH) in celebrating reading and the humanities on Saturday, September 1, at the 18th Library of Congress National Book Festival at the Walter E. Washington Convention Center in Washington, DC. The event is free and open to the public. Hear from historians, journalists, and cultural critics such as Gordon Wood, Isabel Wilkerson, James and Deborah Fallows, and Mark Bowden at the NEH-sponsored “Understanding our World” stage. Enjoy wide-ranging book talks, including discussions about memorializing the Civil and Vietnam Wars, the friendship between John Adams and Thomas Jefferson, and the limitations of big data. A complete schedule of presentations at the NEH “Understanding Our World” stage is available at the National Book Festival website. See an interactive presentation of the NEH-funded educational video game Walden, a game. Named one of 2017’s top educational tools by Common Sense Education, Walden is an experiential first-person game that has players following in the footsteps of Henry David Thoreau during his year at Walden Pond. The game’s designer, Tracy Fullerton, will demo the game at 10 a.m. and 2 p.m. at the festival’s Parade of States. Read about Walden, a game at NEH’s HUMANITIES magazine. Stop by the NEH booth in the Parade of States to speak with NEH staff, pick up a copy of NEH’s HUMANITIES magazine, and take selfies with life-sized cutouts of Jane Austen, Frederick Douglass, Mary Shelley, and Alexander Hamilton. While you’re there, learn about NEH’s EDSITEment website for students and teachers, hear about upcoming NEH-funded documentaries and exhibitions, and see copies of popular books on history, art history, film, architecture, and literature funded through NEH’s Public Scholar program. You can also take home posters featuring original illustrations of Willa Cather or Frederick Douglass, or a Chronicling America poster commemorating the 100th anniversary of the conclusion of World War I. A partnership between NEH and the Library of Congress, Chronicling America is a searchable online database of historic U.S. newspapers. Visit with representatives of one of twelve humanities council-based state centers for the book in the Parade of States to learn about book festivals and literary programs in Colorado, Connecticut, Maine, Maryland, Montana, Nevada, Rhode Island, South Dakota, Tennessee, Utah, Virginia, and Kentucky. Follow NEH on Twitter @NEHgov and #NatBookFest for news about the book festival.